For more than 25 years, Infopulse has been a reliable provider of services in Software R&D, Application Management, Cloud & IT Operations, and Cybersecurity. Our Automotive expertise has grown from the multi-year experience and embraces infotainment, computer vision & augmented reality, telematics & HMI, cloud, NFC, security, and blockchain solutions. Infopulse automotive team provides a full cycle of services that bring flexibility and scalability to our customers starting from the establishment of project requirements, to embedded systems development, implementation, maintenance, and QA. 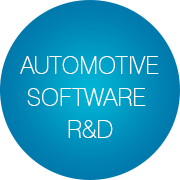 To obtain predictable results, prevent risks, and guarantee top quality, we ground our software development processes on A-SPICE, AUTOSAR, ISO 26262, and MISRA-C++ standards and best international practices for software process assessment. 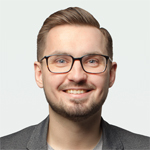 All of this helps us deliver high-quality automotive software development services, ensuring a faster time-to-market, greater productivity and increased revenue for our clients. 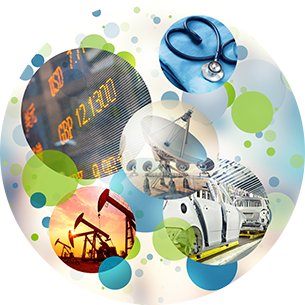 With successfully applied innovative technologies, your business can gain a competitive advantage in the rapidly evolving automotive industry. Infopulse automotive team helps our customers to deliver premium and high-end IVI systems for head units. Today, among our primary focus areas are first-class services for car navigation software, data synchronization, sharing, connectivity, voice assistance, multimedia support, music and video playback. We assist in the creation of advanced 3D navigation solutions, which include, among others, route guidance, real-time traffic information, road construction alerts, weather reports, and location of the nearest POI. 3D navigation is a key to a visually convincing lifelike experience and improvement of the driver’s confidence on the road. Infopulse is notable for the strong cloud systems development expertise. Our aim is to empower drivers with advanced route experience and better guidance by integrating mobile devices with the vehicle’s head unit and utilizing car-to-cloud communication, cloud service, and high-quality maps. This allows synchronizing and sharing navigation data in an easy and convenient way. With such an innovative cloud solution, the embedded navigation becomes more personalized. For example, drivers can keep and access frequently visited routes or destinations, or get high-quality maps for a short-term trip to a new city or country. Infopulse assists in the development of mobile connectivity systems, allowing drivers to use compatible applications installed on their iOS and Android smartphones directly from the car’s IVI. The choice of apps is varied – navigation, weather reports, music and video playback, news search, and more. Some of these applications can be distracting when active during driving. With an in-auto mode solution, drivers can disable unnecessary apps for their trip; block unimportant notifications, in-app purchases, and software updates. Consolidating in-auto mode with voice recognition, both comfort and safety are provided, allowing drivers to send voice emails, text SMS or listen to a voice message, add a reminder to a to-do list, and even use maps without losing their focus on the road. 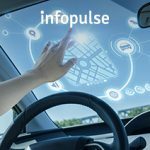 In terms of enhanced driver assistance, Infopulse helps in the implementation of connected car solutions utilizing state-of-the-art technologies and such communication channels as Vehicle-to-Device and Vehicle-to-Cloud. The expertise of our company encompasses iOS and Android client applications, smart and highly secured backend services to collect and process vehicle telematics data. We also enable support of various service providers, such as fleet operators, leasing and insurance companies, to name a few. With the integrated HMI systems, cloud technology, and connectivity features, prevention of incidents and collisions becomes more viable than desirable. For instance, a connected car can predict various hazardous out-of-sight situations like wrong-way driving (WWD), road reconstructions, and obstructions in the way, and give recommendations on how to avoid potential accidents. Our automotive teams greatly contribute in the development of assisted driving components for ADASIS (Advanced Driver Assistance Systems Interface Specifications) solutions. Such components provide efficient information exchange of predictive road data, car position, and its speed, setting an electronic horizon for autonomous driving. Thus, through our work in this area, we are heading towards enhanced ADAS solutions. It empowers drivers with a customized guidance based on the analysis of real-time traffic data, driving habits, and frequently visited destinations. By integrating data from cameras, sensors and onboard diagnostics with new-age computer systems, enhanced navigation provides the best routes and calculates the optimal time for traveling. To comply with international automotive standards and requirements to quality and security, we conduct software testing of implemented infotainment, connectivity, telematics systems and complex navigation features. Running tests in real-world conditions both on the tracks and in the car, we can help identify errors and defects, check durability, compatibility, and efficiency of the new systems. All this ensures stability, excellent performance, absence of memory leaks, continuous integration and functioning of all the components. New technologies raise many security concerns and make vehicles vulnerable to various external threats like network attacks, backend attacks, insecure data storage, etc. Penetration testing is one of the proven ways to analyze potential risks and apply countermeasures. We utilize trusted risk rating methodologies and standards to cover different areas of pen testing: authentication, data protection, access control, management of sessions, input validation, output encoding, handling errors and logging, cryptography, etc. 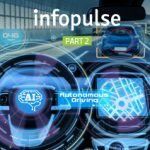 To amplify the success of automotive solutions, Infopulse applies state-of-the-art innovations, such as Blockchain – a distributed cryptographic technology of data storage and sharing between low-trusted parties. It helps to overcome many challenges in the automotive industry such as safe remote car control and diagnostics, protected data sharing between vehicles, secure driver identification and authentication, on-the-go payments, etc. Our company works on Blockchain applications for car-2-car communication, connectivity, mobility, autonomous driving, digital identity, electrification, product lifecycle management, proof of ownership, manufacturing, transportation, insurance, marketplace, etc. Blockchain adoption in the automotive industry is the next step to the era of autonomous, safe, and eco-friendly driving, largely anticipated by new generations of drivers. Infopulse can help you sustain business growth through all the revolutionary transformations and implement effective solutions for the enhanced driver experience. Accelerate your R&D power with our strong automotive expertise. Contact us now for more information!